Fishermen’s bend, 1960, Sandy McCrae leading Lindsay Urquhart and, heading for another Bathurst win in 1960. “Ah, that’s Con McCrae’s Brough Superior SS100, but his son Sandy always rides it.” That told me all I wanted to know. Sandy was something of a joke at the time. He entered the big Brough in every Strathpine and Lowood meeting, but never turned up on the day. He had a motorcycle shop in Lutwyche Road at the time, just past the Kedron Brook Hotel. 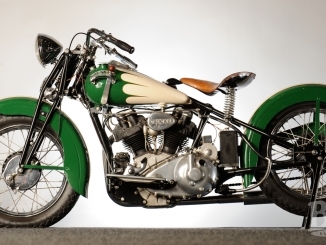 He built up a special for use on the short circuits – a BSA frame with a JAP speedway engine. One weekend, he arrived for practice at Johnson Park, Oxley, and went quite fast, but on race-day he was a definite also-ran. The outfit never appeared again, and we wrote Sandy off as a chicken. 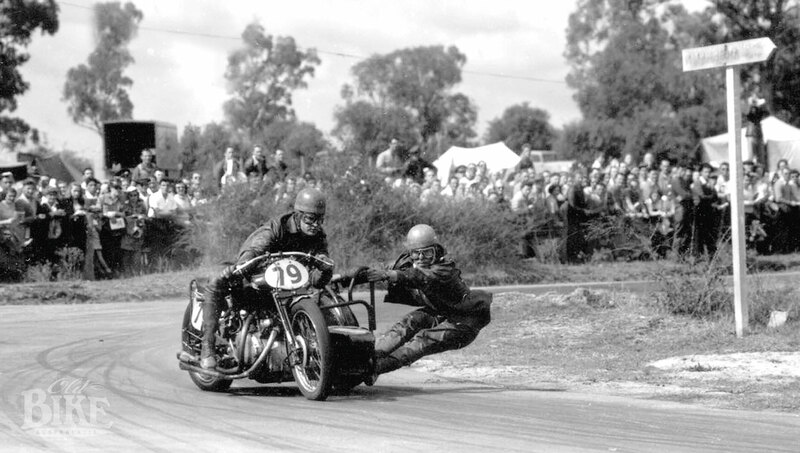 When he turned up for a meeting at the Lowood airfield circuit in 1950 with a Vincent Rapide and sidecar, we nodded knowingly and said, “Bet he doesn’t ride.” Boy, did he ever set us back on our heels. Not only did he ride, but he rode hard. We were spectating at Hangar Bend, a nasty rough off-camber right-hander, and when Sandy forced his way to the front around this difficult turn, we could hardly believe it. It seems that all Sandy ever needed was that third wheel to make him feel right at home. From the beginning, he was practically unbeatable at Lowood, and also at Short Circuits such as Oxley and Heit Park. 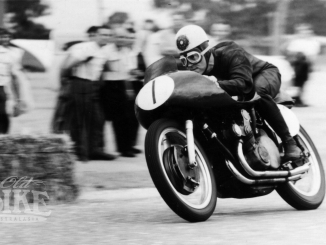 In his Bathurst debut in 1952, Sandy swings his Vincent Rapide into Pit Straight. Sandy’s first ride at Bathurst was in 1952. I took him for his first run around the circuit. Bob Todd had lent me his big Harley and sidebox to take my 250 Guzzi down from Brisbane. After practice on the Thursday, Sandy, his passenger Hughie McKenna and another friend climbed into the box, with yet another bloke on the pillion. Sandy put my suitcase between his knees “Just to steady myself”, and we toiled up the incredibly steep mountain. Got a bit of speed up past McPhillamy Park and dropped down into the Esses. As I braked for The Dipper I realised I was going too fast; all the extra weight causing the brakes to fade rapidly. I managed to find second gear, used up all the road, and just missed the safety fence. When we arrived back at the pits, nobody said anything, but I noticed my suitcase was squashed flat. Sandy finished second to Frank Sinclair in the Sidecar race that year, and won the combined sealed handicap. The following Easter’s Senior Sidecar race was a classic. The top two runners were Frank Sinclair and Jack Ehret, both riding Vincent Black Lightnings which held various Australian speed records. 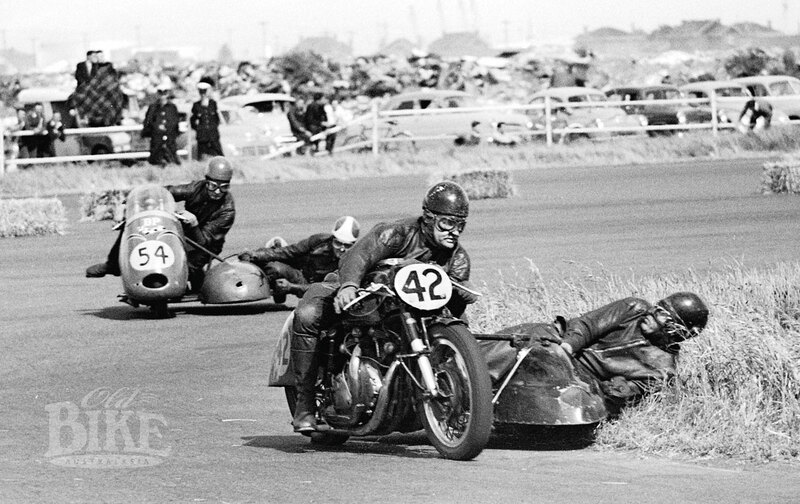 Sinclair however, crashed in practice, injuring himself, and gave his Vincent to Bob Mitchell for the race. Sandy was still on his Rapide, but from the word “Go”, it was a three-way dice, with the proverbial blanket covering them at any one time. On the run up the mountain Ehret clouted a bank and threw his rear chain. Sandy passed Mitchell down through The Esses, where something very mysterious happened – his passenger sustained two broken ribs, but nobody would say how. Mitchell was ahead again at the end of the straight but out-braked himself and Sandy shot underneath to win by a wheel – it was fantastic! Up till now, Sandy had used the same machine for racing on the dirt as well as on the road. As he was taking up speedway, he decided to have three specialised outfits, and he became unbeatable at everything. He rode the Brisbane Exhibition Grounds speedway flat-out nearly all the way. On the Short Circuits he was in a class of his own, and in road racing he was the tops. And this was all on Rapides he tuned and modified himself, winning title after title. For those who never knew Sandy, I should describe him. If you imagine a tall, fearless, lantern-jawed hero, with broad shoulders and slim hips – forget it. Sandy was below average height, well over-weight, wore glasses with lenses at least an eighth of an inch thick, and spoke at times with a very bad stutter. He was without a passenger at Oxley one day, and asked me if I would ride with him. The scratch race was a walkover, he didn’t even have to try – passengering seemed quite easy. Before the All Powers handicap, he sat studying the programme. He called me over and said, “G-G-Gordon, I’ll g-g-go r-r-really quick for f-f-four laps, and then we sh-sh-should be in f-f-front, OK?” Boy, did he go! My arms were aching from hauling myself back into the sidecar with the “Herd” on full power. At all times the outfit was rock-steady and safe; Sandy’s every action was precise and predictable, and as he said, we were in front after four laps. 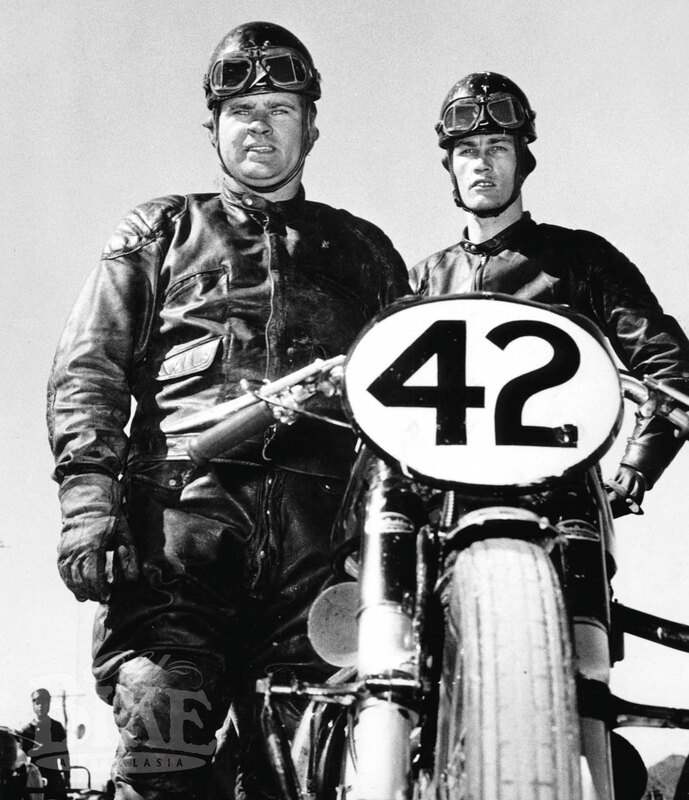 In 1955, while riding at the peak of his success, Sandy was involved in an horrific road accident while riding a solo with his then-passenger Monty Petrola on the pillion. At the top of Webster Road, he was stationary, and a car coming from Gympie Road cut the corner and simply ran over them. Monty was killed and sandy received a fractured skull, broken arms, crushed ribs and internal injuries. I didn’t realise how badly he was injured until one night in the Turkish Baths at Spring Hill (Sandy was always trying to lose weight), I asked him what the scar was on his groin. “Oh”, he said, “that’s where one of my ribs came out”. 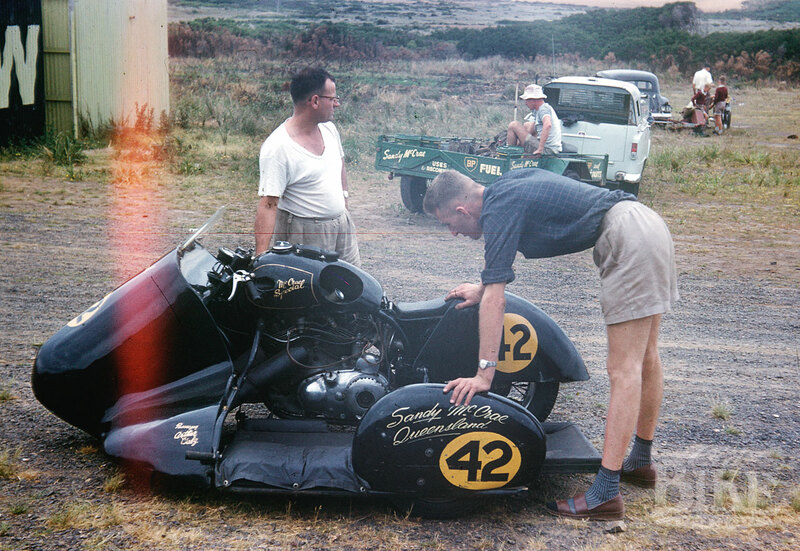 Sandy McRae with Arthur Walz at scrutineering for the Australian TT at Phillip Island, 1957. He had a plate in his wrist and it caused him considerable pain when riding. He took very strong pain-killing tablets before every race. He also became somewhat unstable mentally and his moods were unpredictable. An unfortunate marriage also caused him much anguish. He was, however, riding just as fast as ever. He and new passenger Arthur Walz won Bathurst year after year and he won many Speedway Championships. With his father Con and sister Poppy, Sandy had a second-hand motorcycle and spares shop in Ann Street, Brisbane. I often went to talk with him at lunchtime. He would spent hours staring at some component on his bench, wondering how he could improve it for more power or reliability. He was very secretive about the engine mods in his road racer, but it had a very short stroke and was reputed to develop 115 bhp. I believe it! A star-studded line up at Fishermen’s Bend, 1957. 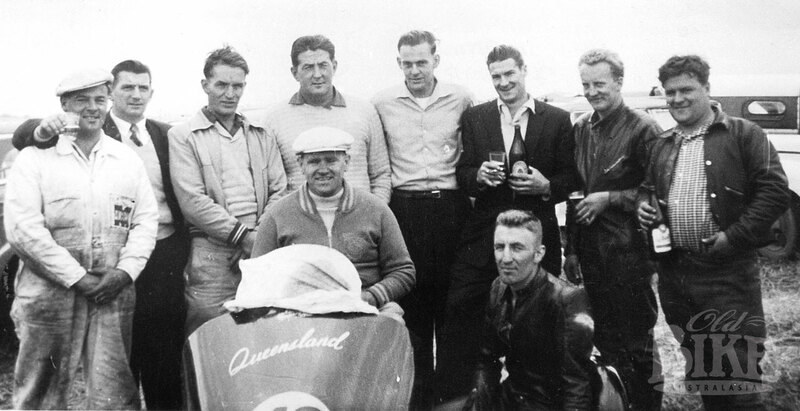 L-R: McCrae’s mechanic, unknown, Bruce Kelly (SA), Don Willison (SA), Max Vipond (Vic), Bill Sullivan (Vic), Ted Gibbard (Vic) Spud Renshaw (Vic), McCrae seated and Ron Johnson (Qld). In 1962 he sold his original McCrae Special to Don Willison in South Australia and built a new one, but his riding was not what it had been. He was also drinking too much. Brian Payne tells a story of one day at his house in Bradman Street, Acacia Ridge, after a few jars, sandy decided to test the outfit down the road, which had recently been bituminised. Unknown to Sandy the road terminated just over the brow of the hill, where there was nothing but a ploughed paddock. The boys watched in disbelief as Sandy passed from view on full throttle. He hit the dirt still doing over 80 mph. Very few people could have brought the outfit to a stop and returned to joke about it. Sandy did. He tried a couple of comebacks with his McCrae Specials, but with little luck, and finally faded from the scene. We were all quite sad in 1977 to hear that he had died, still quite a young man. Sandy McCrae. A glittering career. Although hailed as a Queenslander all his racing career, Sandy McCrae was actually born in Sunshine, Victoria, in 1925. His father Con had been a successful sidecar racer in the 1020s at the notorious Melbourne Motordrome, riding a 1000cc Coventry Eagle JAP. The family moved to Queensland around 1936. 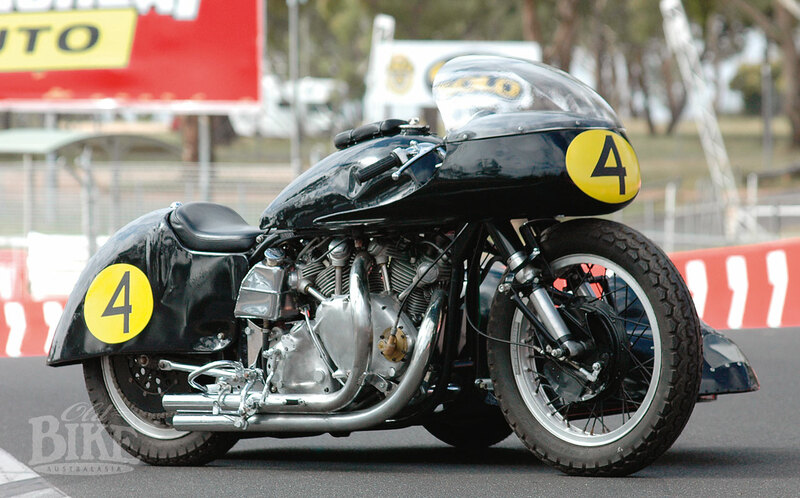 After winning Bathurst in 1953 and 1954, Sandy set about extending his advantage by constructing what became known as the McCrae Special – a Vincent Shadow engine shoe-horned into a genuine Norton Manx Featherbed frame. The sidecar featured a perspex window at the front, which passenger Petrola described as ‘like looking through the bottom of an aircraft landing on the strip”. In an interview in early 1955, McCrae himself praised Petrola’s skills in the chair, saying, “ The passenger does not get nearly enough credit for his part, and Monty plays that part perfectly.” The new machine made its debut at Bathurst at Easter 1955, and totally dominated practice, but in the race, lasted less than a lap when the fuel tank split. In October 1955, The Australian TT was held in McCrae’s own stamping ground at Southport, and McCrae and Petrola were easy winners on the very fast 5.7 mile road circuit. Sandy with his German passenger Arthur Walz on the grid at Bathurst in 1958. Sandy’s injuries from the tragic accident in which petrol lost his life, kept him out of competition for much of 1956, but by 1958 he was back to his best, winning at Bathurst and repeating the feat every year until 1962, when he sold his original outfit to Don Willison, who raced it only five times at Mallala before selling it to Nat Saunders. 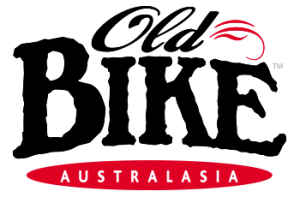 Today, this historic machine is on display at the National Motor Racing Museum at Mount Panorama, Bathurst. His new McCrae Special was not finished in time for the 1963 Bathurst meeting, and indeed it looked like we had seen the best of Sandy. But he returned to the mountain year after year, suffering numerous machine problems, until he finished third in 1968, still with Walz in the chair of the Vincent outfit. As if to silence the critics, he totally dominated the 1969 race, beating Stan Bayliss’ new Honda by over one minute. It was his eighth Bathurst win, spread over 17 years. The original McCrae Special, in the form as raced by Don Willison from 1962. On Willison’s death, the outfit was acquired by Nat Saunders. The McCrae Special is now on display at the National Motor Racing Museum at Bathurst. However the writing was on the wall for the old Vincents, and reluctantly Sandy fitted a Honda CB750 engine into a Lindsay Urquhart-built chassis in 1971, which was later eplaced with a Kawasaki H2 triple. But there would be no more victories at Bathurst, and few results at his local lakeside circuit. Of course, this magnificent road racing career was almost paralleled by his speedway efforts. 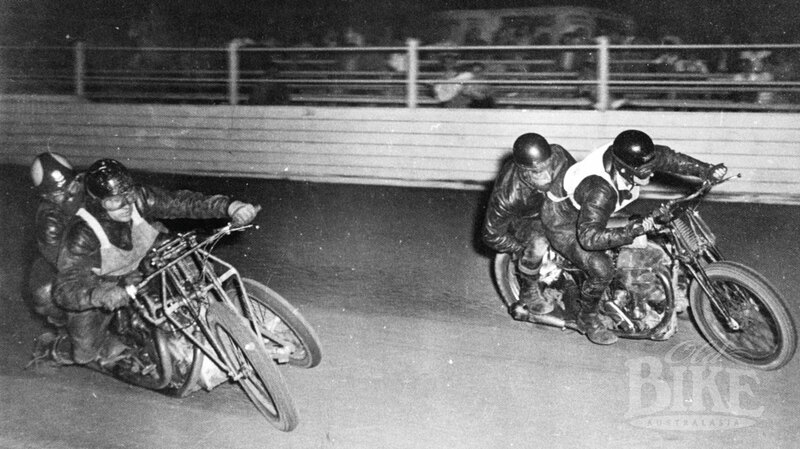 The Australian Speedway Sidecar Championships went into recess between 1953 and 1958, but had it been held there is little doubt that McCrae would have been a strong challenger for the title. In 1963, the championship was awarded to the big Sydney Showground, and Sandy (with Don Carmody as passenger) finished third behind fellow Queensland Ron Johnson and South Australian Don Willison, riding an outfit acquired from Willison. McCrae drives under a Norton outfit at Brisbane, 1958. Later, Johnson and McCrae were involved in a major accident at Brisbane Exhibition ground, and Sandy’s widow Lucille says that he was never the same again. He entered hospital in September 1977 ‘because he wasn’t feeling right’ and died of a multiple cerebral haemorrhage, aged 52. 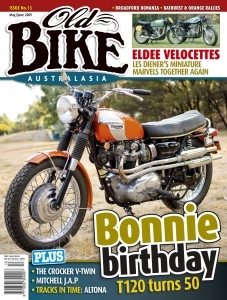 This article first appeared in Old Bike Australasia Issue 13.